We’re seriously wide-eyed over the stunning Palazzo Pants by We Are Kindred! Accented with an elegant botanical print, the palazzo pants feature a cool paper bag waist with a tonal buckle belt and a wide-leg silhouette. Ultra-chic and so versatile, hire the pants for your next cocktail party or date night. Style the pants with a white knit crop top and lace-up espadrilles for the perfect date night outfit. Complete the look with beachy waves and a rose gold cuff. Check out our blog for some makeup looks to try for date night! Pair this fun pants with simple top or try Brea V neck Singlet Top by Friend of Audrey. All products listed are in Australian sizes. Model is wearing size 8. Model is 180cm / 81cm-Bust / 61cm-Waist / 89-Hips. LENGTH: This Pants is ankle length. GREAT FOR: Straight, Athletic, Petite body types. Palazzo Pant - White Bouquet is rated 2.0 out of 5 by 1. Rated 2 out of 5 by Kate from So short, unflattering cut I am quite tall so a long and bottom heavy so love a wide leg pant. These however are a very unusual cut. Usually a big fan of this brand, but these were a cheap looking fabric. Perhaps they might work on someone shorter, but I would suggest no taller than 165cm for correct look. 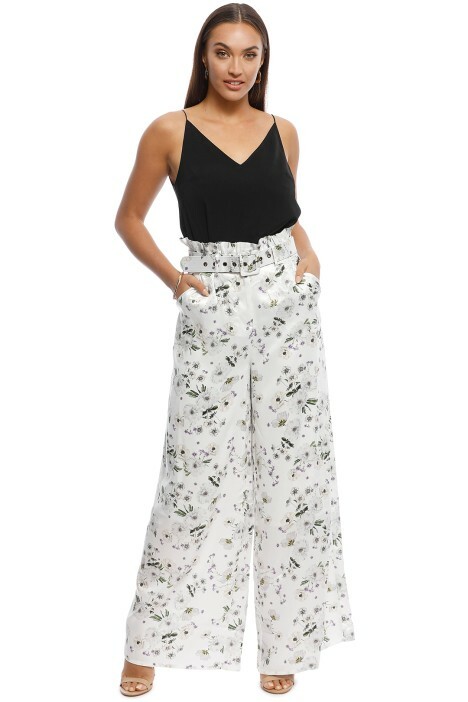 If you're looking for a gorgeous wide leg pant try the Lover Mimosa Pant. They're absolutely gorgeous, beautiful fabric and flattering cut.